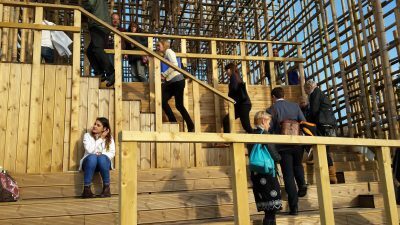 This one day seminar – timed to coincide with the 2014 Folkestone Triennial cultural festival – explored new strategies and approaches employed by artists and cultural practitioners when working within the public realm to build opportunities for cultural development in place-making. The event included a tour of the 2014 Folkestone Triennial. During the seminar attendees examined local, national and international examples of commissions and projects which have taken place within a regeneration (place) context. Taking into account the new financial reality, they explored works which demonstrate a new way of commissioning and offer alternative, financially viable and sustainable models. Attendees explored how artists are challenging perceptions of what public art can be and its role in respect of place making and community engagement. They focused on projects that are risk taking (looking at both successes and failures) and in many cases transformational – achieving exceptional, remarkable works which have a significant positive impact on places and communities. Examples of recent public art projects which have contributed to place-making include a community land trust and co-operative bakery owned by the residents of Anfield and Breckfield in Liverpool; a full scale replica of a 1950s Westland suburban home relocated to Detroit city centre and transformed into an open space for diverse community activities; an urban soundwork of ten location-triggered stories, delivered as a mobile app; and a ‘bouncy castle’ replica of Stonehenge made available for all to enjoy. While these respond to their specific situations and commissioning contexts, they all demonstrate a significant move away from a more traditional commemorative approach to public art. Today we see signs of a new ‘golden age’ where the value and originality of artists’ and cultural practitioners’ work is understood and appreciated by government, private sector and community-led initiatives. As their efforts are captured in efforts to achieve societal and environmental change, what lessons can be learned for place-making elsewhere? Free places were available at this event for Kent Design members, with places available for non-members at £95.00 + VAT. Further information on Kent Design is available by emailing kentdesign@designsoutheast.org.